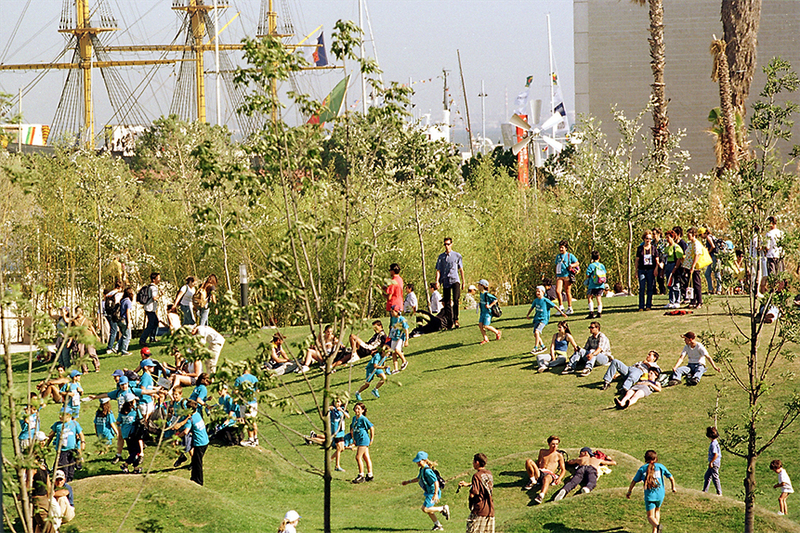 The “Jardim das Ondas” was born out of the dialogue between two disciplines: landscape architecture and fine arts. Architect and Artist aimed their work at providing a recreational space for visitors to EXPO’98. 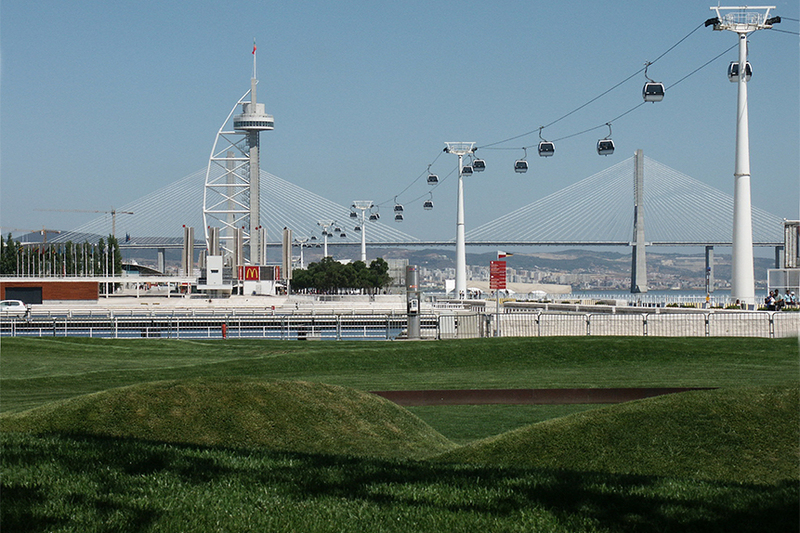 Their intervention is part of the projected transformation of the bank of the River Tagus band in Lisbon undertaken for the Word Exhibition of 1998. 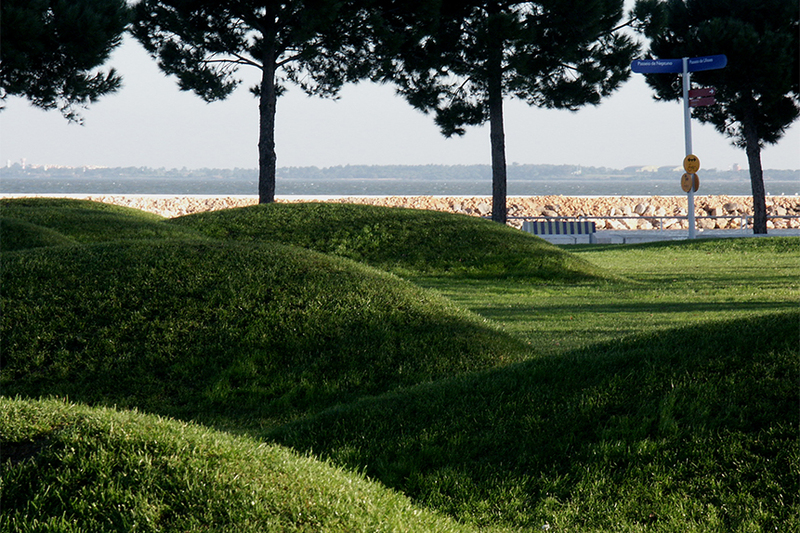 Directly inspired by the movement of the waters, the project was conceived as a grass garden where the terrain was strictly modelled as levels of curves that emulate the rhythm of the making and breaking of waves. 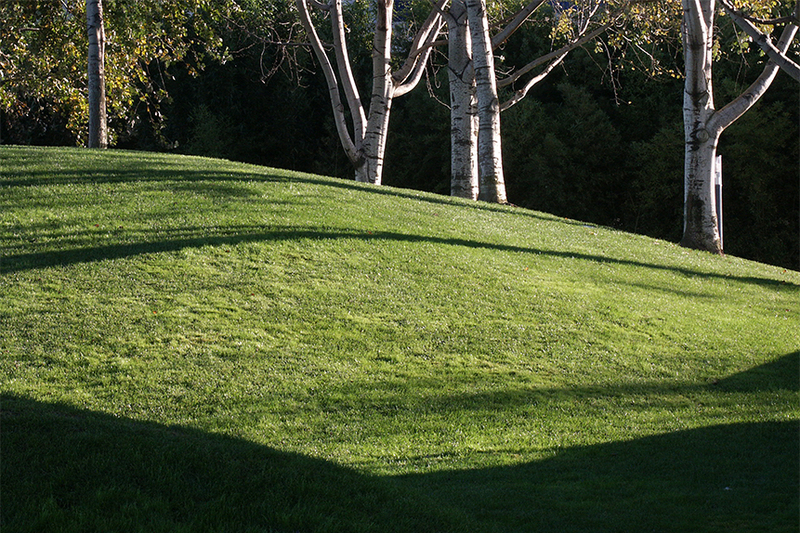 The land is used as a construction material, with grass as covering or finishing material. Both its relative proximity to the river and its positioning with regard to solar movements, enable this use and provide a place of contemplation. Water, light, and greenness thus turn into sensory matter that comes together in an open space. The surface appears wavy, excavated, or buried, according to a general strategy defined on a basis of two methods: the transformation of the terrain by means of systematic and rigorous bidimensional cuts, on the one hand, and mechanical modelling of the sandy ground,on the other. Once in situ and under the direction of the authors, pratice demonstrated that the desired effects could be obtained by manual means. 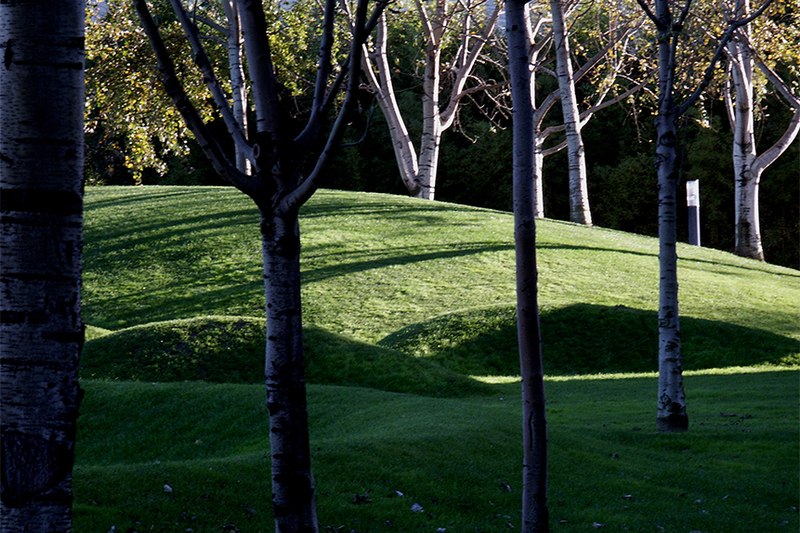 Curved steel panels embedded into the ground were used for the definition of certain spaces, and as retaining walls for the earth. 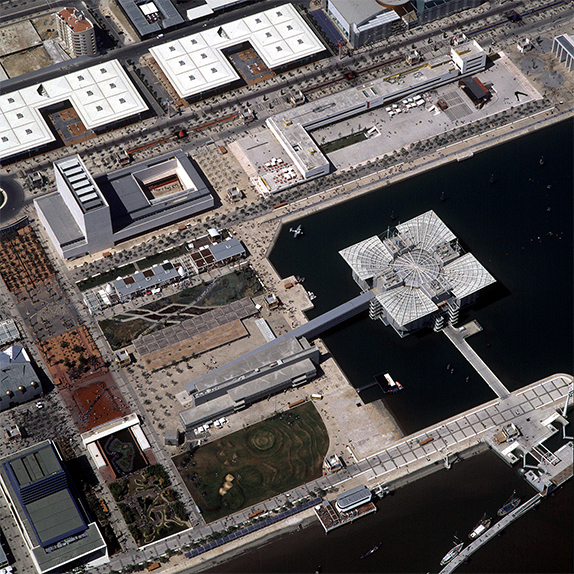 Aerial photographs or images taken from higher levels were used to assist the construction. The covering was carried out with rolls of natural grass, whose composition is predominantly Festuca ovina v. duryuscula, chosen because of its emerald tone and its resistance to treading. The surface was cut to an average height of 5 cm, while the sloped planes were left uncut, producing an intentionally differentiated texture. 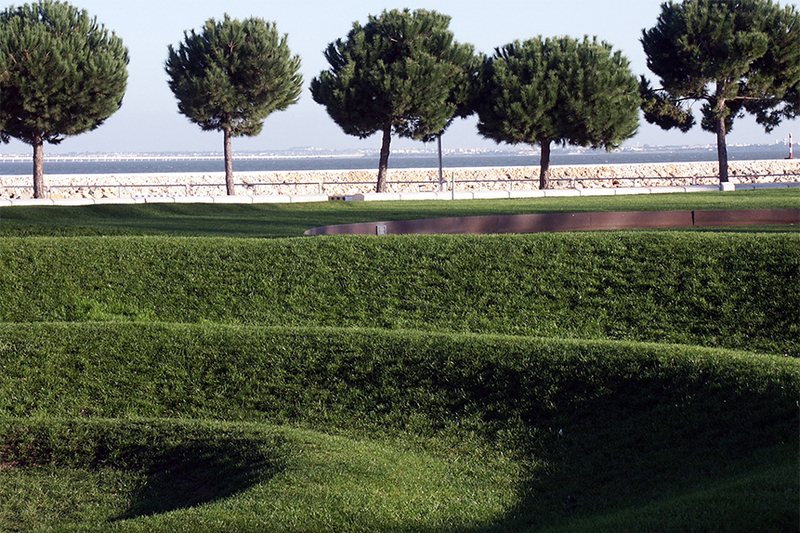 The whole surface is watered through a fixed, invisible, and automatic system, so that the materials resist the effect of the months in which Lisbon’s Mediterranean climate tends to diminish their vitality. 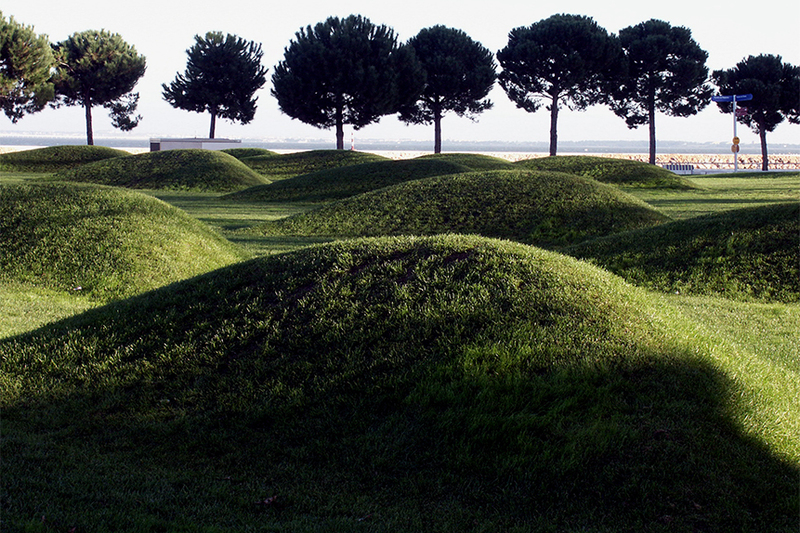 Over a surface of approximately one hectare, the forms are like vibrations, elevations, and also great formations of green grond, which initially seem almost abstract. In contrast, as we move away, the general structure appears, and the distance allows us to understand that which, up close, seemed unintelligible. The project was built in 1998. In 2016 the Jardim has been reabilitated and renovated.